Failing Landscapes, Failing Practices: A Look at Tri-Met’s Landscapes and How We Could Do Them Better! I include this photo, taken beneath the west approaches to the Marquam Bridge, an ODoT property not Tri-Met, as a reference for what is commonly found in transportation rights-of-way. This is not a problem solely with Tri-Met’s landscapes. It crosses the southern end of South Waterfront Park which was one of my responsibilities for 15 years and so I’m familiar with its level of care or lack thereof. The nearest portion, to just beyond the nearest piers, was entirely neglected for the entire period except for where I cut it down to reduce the amount of weed seed I had to deal with in the Park. There is literally nothing that was intentionally planted in the entire space. It is a landscape composed entirely of weeds and it is possible because landscapes for ODoT are of an extremely low priority. It is the neighboring properties that bear the brunt of their decision. It will be interesting to see if they come under increasing pressure over the years as the expensive and undeveloped properties to their south are developed. Currently the Knight Cancer Institute is developing a hundred yards or more away. The Marriot Residence Inn, immediately to its north, has had no effect on its level of care. About a year ago I posted a series of three articles on Tri-Met’s landscapes along the new Orange Line. They were a critical assessment of their design with many photos and explanations for my criticisms. I had a brief correspondence with the project manager after the first two before he stopped responding. I had asked about the maintenance schedule that they had with the contractor who would be doing the work. I did not receive it. Part of the reason was mine, as new ideas came up for me, my interest wavered and I moved on. Still, I’ve never received anything. Now, a year later, I decided to reassess the first portion of the landscape that I wrote about, as it is a section I regularly walk and ride by bike to downtown or to just get out. I would encourage readers to see my previously posted reviews. Gardeners learn many lessons as we progress through our ‘careers’. We read books, attend seminars, take classes, join groups and visit or tour with our peers, but some things are really only learned on the ground as we work, observe and make mistakes. Like when we travel by car, our attention and experience changes when we go from being a passenger to the driver. We see the world differently. We’re more thoroughly engaged. Our awareness focuses and deepens. While all of the other more indirect methods may provide a context, an explanation, it is the doing in the garden that links all of the pieces together and brings the understanding ‘home’ to us…all of the theory, ideas, if we are careful observers, can create a deeper and broader understanding of what we are doing and of the place in which we garden. One of the big things we can learn is that our gardens, our landscapes, are ‘alive’, they have a life of their own which we can influence, or to a lesser extent, control, if we commit enough time and resources to the task and, when we’re wrong, we can watch them rapidly deteriorate if our efforts are inadequate or misdirected. Nature is a dynamic force. Left on its own it moves each particular piece of land toward a diverse and complex landscape, unique, attuned to the conditions in play there. On an undisturbed natural site, an increasingly rare phenomenon, a casual observer visiting from time to time might think that it is ‘fixed’, a climactic expression of that particular place. In fact, it is anything but static as each organism works toward its fullest expression in league with some, symbiotic even, and, at other times, at apparent cross purposes as they compete for light, water and nutrient or material sustenance, sometimes directly consuming the other. It is a gigantic and nearly unimaginably complex equation each member simultaneously contributing and taking what it requires…until it can’t…all the while adding complexity and to the richness of life, an overall positive evolution. It is a dance and it has been going on for millions of years. As gardeners we are offered the opportunity to ‘peek behind the curtain’. These glimpses offer us moments to reclaim the sense of wonder and awe that we once viewed all of the world as children with, only this time with more understanding. Increasingly, and frighteningly, our modern world has consumed and transformed these places into what we recognize as development, ‘disturbed’ or urban places, where human activities dominate and have transformed the natural world, but this has not changed the forces still at work, rather it has changed the ‘game board’, not the rules of the game, the dynamism. We fool ourselves if we think that this earth is nothing more than a giant canvas subject simply to our will and whim, our plans, however grandiose or simple. Buildings and roads still slowly crumble while landscapes tend toward their own fullest expression. We haven’t figured this out yet as a culture, that if we desire that our own creations thrive and endure, they must be aligned with the natural forces that work here, anywhere. To deny this puts a never ending burden on us of keeping these forces at bay, a commitment of labor and resources that when insufficient, when priorities and politics shift, will no longer be there to stop the decay and dissolution of our often willfully ignorant designs. We have been deceiving ourselves for decades. We have failed to recognize the inherent dynamism of the world. We build structures and landscapes that are monuments to ourselves and the moment we find ourselves in…static structures and landscapes fixed in time, an obvious fiction. Much of this is essential for the support of and the continuation of an urban population. But we approach it like children unable to take responsibility for what we have already done, unable to commit to the long term and endlessly fascinated by the next new thing. We defer maintenance on structures long enough that they become impossibly expensive to ‘repair’ so instead tear them down and build new at huge cost to our resource base. We scrimp on landscape maintenance cutting 3% here, 5% there, or deferring it completely until revenues can be found that are sufficient to cover them without realizing that landscapes are dynamic, they don’t wait until we can catch up, they don’t ‘degrade’ linearly, a 3% cut in maintenance does not result in a 3% decline and cannot be reclaimed by simply adding the 3% back in a year or two. No, declines are exponential and they cannot be simply and cheaply reclaimed once they are severely degraded. They are not canvases that can be ‘painted out’ and planted again. They have histories that follow them in the form of degraded soils and seeds that will present problems for decades, depending, again, on how the landscape is ‘approached’, how ‘corrections’ are made. Our decisions, once effected, remain in ‘play’ long after they were made. An overwhelmed home gardener can move and start again, selecting a new site with the help of the experience they gained from their previous garden. Over time, as this process goes on, repeated over and over, the ‘canvas’ that we each start with will present an increasingly difficult starting point. Institutions and government entities don’t have the luxury of moving and starting over. It is more important that they get it right and ‘correct’ problematic designs that they are burdened with, improve their maintenance practices and work to insure that they don’t repeat their mistakes…, but this is not apparently the case, because, like individuals, institutions, agencies and government bureaus are human constructs and, as such, suffer very human frailties. They also possess our ‘strengths’ and, sufficiently motivated, can change. At some point, as a people, we will have to start acknowledging the necessity and complexity of the natural world. The denial or refusal of this can only last so long. We are rapidly closing in on the point where our urban world is crumbling faster than we can rebuild it and large enough that most of our remaining, intact, wild areas are feeling similar ‘pressures’. There are simply not enough resources to continue this very much further into the future. Political leaders with enough courage, humility and foresight to change course are desperately needed. The backlog of deferred maintenance, of obsolete structures and landscapes, is swamping us, while we continue to build new, in the old pattern, for those people wealthy enough or disassociated enough, that they willfully and effectively demand that our pattern of ‘progress’ continues unchanged. None of the needed changes are beyond our abilities, we simply haven’t possessed the political will to change. There are still too many, well positioned individuals, pushing and demanding the same old thing. I pick on Tri-Met here…they are an easy and obvious target, regarding their landscapes, but there are many others out their, locked in to old habits, defending their practices or simply lacking real support to fully commit to a different path, one that acknowledges our reality today and the conditions at play in the landscape and community. We are in grave need of new/different leadership, leadership that acknowledges all of this in our changed and precarious world. A year ago this was largely clean gravel with a scattering of new weeds germinating from the rains in September. Today the Buddleia are nearly 5’ tall and much of the remaining space is filling in with annual and perennial weeds. Behind the fence are both Tri-Met’s and the railroad’s tracks and their clean gravel bed, clean because such spaces are typically treated with powerful and effective soil sterilants, sometimes called bare soil herbicides. These kill both pre-existing plants and prevent the germination and establishment of new plants, for periods up to 10 years, depending upon the soil and weather conditions, longer in drier climates, less in wetter. Federal law, through FIFRA, specifically denies their use in landscapes, typically residential, commercial, institutional and Parks, reserving their use to rights-of-way and certain utilities uses. They are as effective on desirable plants as they are on weeds and they are often water soluble, meaning that water can move them through the soil, carrying them potentially into the ground water or to adjacent landscapes. They are a huge labor savings for the railroads as I’ve pointed out in earlier postings. The same gravel ‘landscape’,this photo was taken last year, is a curiosity to me….Why is it here? Currently maintenance does not appear to utilize either pre-emergent herbicides on it or post-, both of which are allowed on such sites. At over 200’ long this is a substantial area…for what purpose. It would appear to be an area sacrificed to the budget axe, left unplanted without any irrigation without any thought given to future maintenance. It has deteriorated rapidly from this already. Next year it will look as if it has always been a weedy mess as the problem escalates and its burden of weed seed increases exponentially. This is a compact cultivar of Pennisetum alopecuroides, a bunch type ornamental grass with bare soil between each plant’s crown. This particular planting is surprisingly clean. I include it here because of the trash…. There is always trash in this area, this is again a problem with such transportation corridors as maintenance in general is infrequent. Contracted maintenance is generally specified, in detail, including the frequency of visits. It is pretty apparent that the maintenance schedule is minimal. With many new landscapes this is possible, because there can be a ‘honeymoon’ period with new landscapes depending on the the condition of adjacent landscapes and the soil seed bank. A heavy burden of weed seed can negate such a honeymoon and will result in a landscape that is quickly overwhelmed if maintenance is not frequent enough. This planting of Liriope ‘Silvery Sunproof’ is immediately adjacent to the above. This Liriope forms spreading clumps, not a continuous mat and so is more subject to invasion. This cultivar is often used as an edging plant as it is less likely to invade its neighbors than cultivars of the other commonly used species, Liriope spicata, though it too can become a problem. This same growth habit means that it is less likely to be able to resist invasion. The related species, L. spicata, forms a spreading mat and can be more ‘weed resistant’. One might think that it is immune to infestation by weeds but this isn’t true. Monocultures, which this is on a small scale, fill only one niche that is available. Particularly vigorous seedlings may possess the energy to germinate, root down through the mass of roots and over top the pre-existing planting. It is generally only the most aggressive plants, often invasives themselves, that can dominate to the extent that they can maintain single species stands over time, like Purple Loosestrife or Reed Canarygrass, and even then under certain growing conditions. (Keep in mind that a plant like Clematis vitalba can bury Hedra hibernica here with enough sun.) Liriope is not one of these. In this photo you can see how a seedling of the adjacent planting of Pennisetum has ‘volunteered’ amidst the Liriope. Sometimes the plants we specify in plantings themselves possess the vigor to move around a landscape which can be problematic as they disrupt the intended design effect, though this is a ‘normal’ characteristic of a natural plant community. There is also Epilobium that has moved in here, though its less obvious. The green mass further back is Dutch White Clover, commonly planted, and entirely capable of invading landscapes, as this one has, to the point of dominating. This one, an ecologist friend classes as an ecosystem disrupter, so powerful is its ability to dominate. In this picture of Liriope, a different sweep, the invasive Canada Thistle has joined the ‘dance’. Another North American native, this one too is incredibly invasive and possesses the ability to dominate on sites that are repeatedly ‘disturbed’ and can invade more manicured sites as well. It is a prodigious seed producer, casting them widely via birds and wind. Their deep root systems make them impossible to remove manually. Canada Thistle is also spread in soil upon which it’s grown as relatively small pieces of root/rhizome are capable of producing new plants. Seed heads of both Dandelions and weedy grasses can also be seen above the Liriope foliage as well as Plantain. While this is a cultivar propagated for use in the landscape, it is derived from an Asian species, Liriope muscari. It is well suited as an edging plant, though Landscape Architects are frequently using it in broad sweeps. It is also not well suited for sites like this in full sun with the addition of sun and heat from adjacent hard surfaces. Such stresses make it more vulnerable to opportunistic weeds…and that’s what we have here. Helictotrichon sempervirens, Blue Oat Grass, is planted here in conditions that might at first seem conducive to success, but in reality are not. These plants are growing very weakly planted in heavy soil under regular irrigation. Here the crowns are rotting resulting in spindly plants, a problem that is compounded by the mulch that holds moisture tightly around the crown and our heavier soils here. These don’t have a chance. What is beginning to take hold here, though it is difficult to photograph at this growth stage under these light conditions, is the very aggressively spreading annual Crab Grass, Digitata sanguinalis. Each plant is said to be capable of producing upwards of 8,000 seeds. This particular weed wasn’t much of a problem 30 years ago but has been proliferating, particularly across rights-of-way, riversides, vacant, disturbed and compacted sites. It seems to be everywhere. This planting as managed is essentially an opportunity for any weed in the area as the intended planting struggles and dies out. Prickly Lettuce is at the sidewalk edge along with many other weed species. A year ago when this Lonicera pileata was planted I noted the wide spacing and the opportunity for weeds to move in. It is since notable how slowly the Lonicera has grown here, as indicated by the chlorotic, yellow, new growth, that is not a variegation, and the variable size of the remaining plants, leaving it in a more ‘vulnerable’ state. Some of the Lonicera appear to be missing, either pulled out or dead. I’m a little surprised at how little weed invasion has occurred here, given the variety and density of weeds in nearby beds and adjacent properties and its state last Fall. The Equisetum here, is a native species of Horsetail or Scouring Rush. While native this is an extremely aggressive spreader and can infest sites in the Willamette Valley that are not even particularly wet. It was likely here before the Orange Line project was built or it could have been brought in with purchased topsoil. Once established on a site it is extremely difficult to get rid of, which is why when it is brought in with soil, it is so important to act quickly to get rid of it. Small pieces of root can produce a plant. This brings up the issue of beginning any landscape with a clean slate. Newly planted landscapes are at their most vulnerable, having a relatively high proportion of bare soil and new plantings that have not yet put out their roots into native soil and so will grow at a reduced rate. Commonly pre-emergent herbicides are applied to beds like these to deter weed growth, but even these don’t work on previously established weeds. Also, each such herbicide is ‘effective’, kills or controls, a limited set of weeds and they do this by chemically impeding the growth of sensitive root tips or the extension of the cotyledons, the emerging stem, up from the germinating seed. Pre-emergents create a shallow chemical barrier near the soil surface. Some can also be effective on the root growth of certain established species of desirable plants so caution must be taken with their use. Back to the Scouring Rush here, most pre-emergents are not effective on them. The use of such herbicides requires that the user knows both the weeds that are problematic on a given site and the resistance of the planted species and varieties so that their efforts are both an effective while not being deleterious to the plantings. Again the Liriope m. Silvery Sunproof. This species would normally occupy a mixed plant community that contained other members including various broad leafed perennials and shrubs their roots systems occupying different volumes, intercepting the sun and energy that here powers the growth of weeds. Nature doesn’t create single species stands, except in very rare situations. Here it is up to maintenance staff to maintain this imbalance, which would need to be regularly and frequently done, but possible with considerable commitment to resources and labor. Red Clover has invaded and if left on its own will dominate. Because of the way that it roots as it spreads the longer one waits the more difficult it will be to manually remove. Chemically broadleaf weeds like this can also be difficult to kill with post-emergent herbicides. As with most weeds they are more effectively dealt with at an early stage. Here’s an interesting link to an article discussing weed control in Liriope out of Delaware Extension. Keep in mind, if you read it, that drought tolerant in summer wet Delaware is different than here. Here we have a vining annual small leaf Vetch, that grows relatively quickly. Very often these clammer up desirable plants, like the Lonicera here, where they quickly produce and drop their seed into the plant below where the next generation can get well established before maintenance can find it. Pulling these often results in them snapping off just above the ground, an injury they can quickly recover from. All Vetch are nitrogen fixers, but this positive must be weighed against their negative aesthetic impact as they can bury their neighbors. In a ‘wilder’ landscape managers might choose to ‘overlook’ them. Other vining weeds are similarly difficult to control once established including other common species like Field Bindweed and the nearly ubiquitous Clematis vitalba. The later two have the additional problems of forming much larger masses and being perennial. Spraying with broad leaf post-emergents, which can control these will also kill most of the broad leaf perennials and shrubs they have over topped. Leaving staff with the time consuming tactic of going after their crowns and grubbing these out or treating them. This later technique isn’t effective on the Bindweed because of the way it grows, leaving one with constant removal of top growth or spraying. Prevention is by far the best option. It wasn’t until later when I looked up this property, in the photo to the left, to better understand the issue, that I discovered that the property for sale inside the fence, graveled and in the process of being over taken by weeds, is also owned by Tri-Met. The narrow fence line planting of a west coast species Iris, Kelsey Dogwood and roses adjacent to the sidewalk here on SE 17th, immediately south of South Powell Frontage Rd., is in the process of being overwhelmed by Crab Grass, Cat’s Ear, Blackberry and a host of others. This is an impossible planting if Tri-Met’s own real estate people don’t step up to manage the weed’s on their property. This is common of such properties up for sale, any money spent on weed management seems to be viewed as wasted. The second picture shows another Tri-Met property listed for sale, fenced, with a weed population growing largely on its own near several of their planted landscapes. This tree well, near the railroad and the Rhine overpass, shows heavy weed germination after a few Fall rains. This well no doubt collects an abundance of weed seed from the poorly maintained edges of the railway right-of-way. This bed shares a long edge with the Rhine St. Station. It remains relatively clean. I walked it and found only a few things like Red Sorrel, a spreading perennial weed, but all and all pretty good. I would attribute this to it being an initially clean site without any nearby sites serving as continuous and heavy producers of weed seed that could move in. For many weeds, distance from a weed source, is a major limiting factor. In any modern urban landscape there will be weeds. This photo shows a typical Tri-Met, contrived, landscape with its simple massing and sweeps. It also shows weeds. Maintenance staff must have a standard, a threshold for action, what do they leave, when do they act. Aesthetics is the major criteria in this type of landscape for determining action and timing. 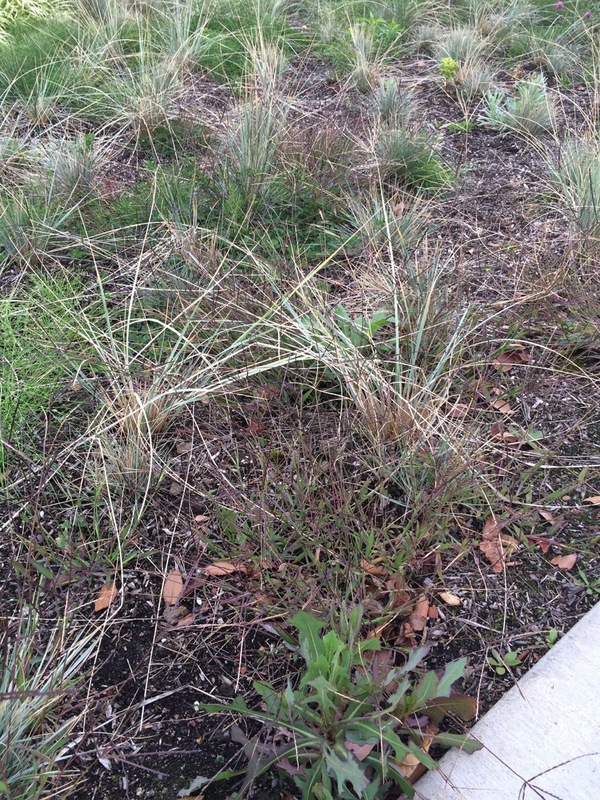 The photo shows how disruptive the color and texture of weeds can be, how they interfere with the designers intent. Of course you must be careful with this because, for example, one stem of Canada Thistle, such as the one in the foreground, may be no big deal, but leaving it, allowing it to establish can result in larger problems down the road. You have to be very careful with perennial weeds when weighing this. This was a major engineering project. The problem with such projects is that the landscape then becomes secondary and many areas end up receiving inadequate soil prep, because of the engineered structure’s needs. Sometimes it would be better to exclude a landscape altogether from areas when conditions are too compromised for healthy growth. The gate shown above is on 17th, south of Powell. Yellow Nutsedge, a persistent and difficult weed to control, occurs here with Horseweed, Barnyard Grass, clover and dandelion. Nutsedge is commonly spread between sites in soil, nursery stock and mulch. It’s rhizomatous and forms ‘nutlets’, little tubers below the soil surface which can spread the plant. The patchiness of its locations along the line here indicate to me that it came as a contaminant. Now it can easily spread if left to flower more widely or by expanding clumps via growth of its nutlets. Hoeing or pulling is rarely effective on this weed and it isn’t easy to control with most herbicides. This area, immediately around the gate, should not have been a ‘landscape’. It will always need to be maintained clear which will require the use of pre-emergent herbicides that are effective on Nutsedge or it could have been hard surfaced. The third picture, adjacent to McLaughlin Blvd, shows the track area that is managed weed free, with sterilants, and the raised gravel base of the sidewalk, unplanted, without a retaining wall, collapsing and filling with weeds, a landscape problem created by a poor engineering solution. A little further east and here the weedy Tree of Heaven and Empress Tree, large problematic weeds in our area, have joined the fray. This edge will always be an issue. Last year this area was bare, unplanted, with ‘soil’ of poor quality containing rock and much of it topped with gravel. This year it is full of weedy growth, sidewalk to curb. It’s possible that it was seeded with a mix of species including Dutch White Clover a common component of ‘ground cover’ and ‘wildflower’ mixes. Ecologists consider this Clover to be an invasive. There is also some Yarrow here another common element of such mixes. But these are not alone. Canada Thistle is thick in places. Chickory, a too common weed of disturbed sites is here as well as many others. What is the goal for this long weedy strip? A typical railroad edge landscape with Tree of Heaven, Blackberry and many other matured weeds all capable of moving to nearby Tri-Met property. This puts incredible weed pressure on adjacent landscapes. Maintenance staff would be dollars ahead to control weeds..on the railroad’s property. The railroad has a long history of indifference regarding its own landscapes. The second photo shows the section of railroad looking east from Division and SE 8th. While the woody weeds aren’t as bad here, they were west of here before they were recently cut down, this entire corridor is a problematic weed seed producer for all of the Tri-Met properties. Last year these beds around SE 8th and Division Pl. were in bad shape suffering from a high density of aggressive weeds including Canada Thistle. They were left in place through seed stage. This year they naturally returned. A maintenance crew came through at some point mid to late summer and cleaned this series of three beds mysteriously cutting the culms of the Flowering Reed Grass down by half as well, one of this plants most ornamental features. I don’t know if they manually stripped away the weed tops at that time or if they had treated them with herbicide. Treatment to be effective must be made to Canada Thistle after the flower buds have formed. Time will tell. Here’s the dreaded double fence, one permanent and the other screening off this contractor Stacy & Witbeck owned property. Double fencing create impossible to access areas that often become weed strongholds. In this case the state and Portland listed weed, Buddleia, have quickly matured and are seeding this Fall. The second photo shows another contractor site, this time on Tri-Met owned property, that has served as a staging area and is a major weed seed producer. Here, between the fences is a Tri-Met landscape that was planted and is being overwhelmed. Tai-Met’s strip planting behind and to my left, has the additional problem, and it is a major one, of a large expanse of weedy railroad strip, from the edge of road shown, north to the graffitied retaining wall, that gets sprayed or cut down rarely and is a heavy producer of seed. Cutting can be an effective way to control weed seed production, but it must be timely. When you realize that this is a Kinnickinnick planting you can quickly see how dense the weed population is. This photo gives me pause. The large bark area, free of weeds and plants indicates toxins??? Why is it the only place free of any growth? It is an not an activity area. These four pics above are of the same bed where the Orange Line turns away from the westside Tillikum Bridge ramp. This site has been designed with a very different aesthetic than the previously discussed east-side beds. It is a mostly flat broad strip between two highly engineered structures, with imported, likely compacted soil, planted first in a pure stand of the more alpine ground cover, Kinnickinnick, the second, more northerly, in native Strawberry. A broken line of Incense Cedar dot it. This is an irrigated planting. I do not know what the schedule is, but it would seem to be frequent. Kinnickinnick is a drought tolerant native, the site is flat and the Kinnickinnick is doing poorly as have the trees in the upper portion which indicates wetter soil conditions. There is a rough weedy bank high above the tracks that no doubt dumps weed seed here. The weed growth is heavy. To the north, the strawberry is planted and has down well. It is much more tolerant of regular irrigation. Annual and herbaceous weeds have been less competitive as would be expected given the Strawberry’s vigor. Still, with a simple single species planting of a ground cover, tree seedlings are volunteering as is the invasive Clematis vitalba, of which there is a mature mass of growing next to the nearby freeway ramp, currently heavy with seed. The Orange Line runs along up above on its sweeping elevated ramp in this photo. This corner, at the base of SW Harrison, where it becomes Riverplace Parkway, follows the trolley line on its way to the two lines meeting at the western abutment of the Tillikum Bridge. This picture provides some more context for transportation agencies. It appears nothing in the landscape is planted, all has grown on its on withstanding an occasional whacking back. The above unirrigated banks are mown annually. This project was completed in March of 2005. These are taken of a relatively weed free ‘clean street’, curb side plantings along SW Lincoln St. Adjacent commercial landscapes are maintained clear of weeds likely using herbicides, as is common practice. These generate very few weeds and seed to spill over. The last photo shows the common weed, Yellow Flowered Oxalis, that has found its way into available crack spaces here sprayed with a contact herbicide. The tell tale sign is the ‘spotting’, dripping of dye, on the concrete, a common additive when spraying, to help the applicator’s effectiveness. The drip is an equipment problem. Weeds can still arrive airborne, via wind and birds or be washed in along the street and sidewalk through the ‘cuts’. The absence of significant area seed sources helps greatly with weed control here. Back across the river, I came by this property a few weeks earlier and a woman was working to remove all of the weeds manually, which were immature and relatively small, from the gravel mulch at the base of the wall, which extends around the corner, and belongs to a storage company. The tree wells along the curb are part of the Tri-Met project and are clean as well, due to here diligence? likely. In any event her dutiful efforts benefit nearby properties by reducing the weed seed load. Interestingly much of the property on the west side of 17th here, stretching from just north of Holgate almost to Mcloughlin, is owned by private investors, some previously used industrially and is contaminated, sporting DEQ monitoring wells, or Tri-Met and is awaiting redevelopment having had structures demolished and cleared and is being held in an increasingly weedy state. This is no doubt a factor in Tri-Mets adjacent and median finished landscapes. Barnyard Grass – There are several coarse weedy grasses in here that I’m not sure of. All of these weeds, and more I didn’t identify, were found in the one large median bed on 17th between Pardee and Schiller. The list doesn’t give you a complete ‘picture’ or understanding of the weed problem there. Some are relatively few in number others are quite common in large loose swaths…all of them, assuming maintenance practices and schedules continue as is, will likely be increasing in number, growing in the open spaces between the intended plants, sometimes within their crowns, within the niches the design has created for them, unintentionally. Each of these have particular characteristics of growth and habit that have helped determine their ‘success’ here. With experience, we understand something of their persistence, their ability to dominate or to yield to other plants as conditions and populations in the bed change, because, change they will. Knowing this, can help us determine the most effective means for their control and the timing of those efforts. Before we take action though we need to acknowledge all this and make a decision, a broader decision about our goals for these landscapes that will determine the strategies that we choose. I spent years walking through such beds doing evaluations, planning strategies, attempting to understand what was happening in any given bed, how my actions effected it, whether they were worthwhile or not. Before I could choose one, I would have to decide what is the goal in each, is it to maintain the designers simplistic ‘graphic’ design with its discrete swaths and strokes placed on the landscape, the canvas, static and fixed? or is it to create a more sustainable landscape with a dynamic community of plants, fitted to the site that can fulfill our functional needs for the space, with a more natural aesthetic, within the confines and limits of the overall landscape? One recognizes the primacy of the designer and subsumes and minimizes nature, the other attempts to acknowledge the wildness within each space…within its aesthetic. Each requires a different approach, a different kind and intensity of maintenance. The former, the static, fixed vision of the landscape, requires an almost constant ‘disturbance’ of the site proportional to its degree of imbalance, a commitment over the life of it to continue indefinitely, while the other is essentially an approach that could be characterized as transitional, adaptive, transforming each over time into a more stable and simultaneously, dynamic landscape that is ‘responsive’ to the changing conditions on each site. Each requires a different mind set: control vs. cooperation, rigidity vs. flexibility, artifice vs. naturalness, limitation vs. exuberance, built vs. alive. We’ve been ‘building’ landscapes much like we do buildings and our needed infrastructure. But landscapes are essentially alive and to ignore this profound difference, as we have been doing, is incredibly wasteful and, ultimately, self destructive, self defeating. Healthy landscapes are growing and alive. Their efficiency lies in this fact. On the other hand our urban infrastructure, upon which our modern lives depend, must be well engineered and beautiful. It is at the edges, of the engineered and the living, that we must be especially careful so that the engineered does not exclude the living. We as humans are living as well. Our needs are remarkably the same as the rest of the living world. Build a world that refuses to make accommodation for the living and it will fail, us with it. We need to begin remembering and revaluing the living world, especially in our cities so that they do not keep creating ever expanding dead zones with effects that reach far beyond their political borders. Places that we are increasingly driven to escape to where nature remains beyond its influence and transform them into places that more fully nourish all life. This is not an impossibility, the one does not automatically exclude the other. We are human beings and one of the things that defines us as such is our creativity. We can do this. Weeds were all once native to a particular place, their vigor suggests that they were members of a variety of plant communities, with a particular and relatively wide set of conditions, often likely found quite broadly geographically as well as in terms of their site requirements, but native and natural they were, but they were limited and contained as well, geographically, and in terms of the relative slow rate of disturbance and of the introduction of new species. They are so successful as weeds today because we have this habit, a cultural ‘default’ if you will, that determines the base conditions within our landscapes. We have brought ‘these’ weeds with us, selecting them, fine tuning them along our historical path…alter this default pattern and we change the weed population, the species that comprise it, the intensity or degree of the problem, even whether we have a problem at all. This process itself is still changing as we create more and attempt to maintain these out of balance landscapes allowing the most aggressive adapted weeds to occupy them as they arrive in our region. To change this pattern and practice requires consciousness, an awareness of the conditions and the plants themselves and perhaps most importantly, the commitment and the patience to see the process through back to integrity and balance through the natural dynamism at work in any landscape. Weeds are not simply weeds. They are plants, much like any other, imbued with potential, unique to themselves that exist in a world of relationship where every plant exists in relation to the life and conditions that it finds itself in. There is no hocus-pocus, no essential organic ‘evil’ shared amongst a group of plants we call weeds. No magic. They are with us for a reason. Take away the reason, change the conditions and they’re gone or reduced. Of course it’s more complicated than that because there is a lag period associated with the bank of seed in the ground, of weeds and desirable species, and the bio-chemical, structural and textural changes we’ve made to the soil, all the changes, all of the breaks in the normal healthy cycling of energy and resources that have a persistent and accumulative effect. The green world is broken…and we did it. It is not beyond us to grow it back, if we choose to, but we can’t do it if we continue with our practices of continual and cyclic site disturbance of forcing simplistic ‘graphic’ designs on the ground. We will only find our way as our landscapes regenerate themselves…or not, if we can find it within ourselves to do this. It is not a passive process, rather it will be one of commitment that will require a certain openness and flexibility that is very different from the much more rigid and formulaic approach that we have taken to this point. We need to understand the inherent value in the operation of the natural world…that it has a kind of base or primal importance to the very existence of life…that is essential. We have for too long been proclaiming that we, in our superior ‘wisdom’ are the ultimate arbiters of what is valuable and have determined that everything has its price, that, then, ultimately nothing is essential. Our landscapes are a powerful opposing argument. We have been breaking things down, reducing them to their fundamental, constituent parts, to understand them in a singular, and important way, for so long that we’ve forgotten how to see wholeness and health, the inherent beauty in the wild, the dynamism that derives from relationship. We’ve unlocked the code of DNA while simultaneously chasing the life out of the world that we live in. We need to bring these two philosophies, these two ways of knowing, back together and create a new view of wholeness, health and relationship, linking the disparate parts back into a viable whole that can sustain itself much as it did for the millions of years before we became numerous enough, in possession of a potent enough technology, that we have become a serious threat to the very life on this planet, ours included. Today, many of us live in relative comfort consuming the life and resources of the world around us while an ever increasing population, of species, suffers. These are not separate problems. We can only choose life and all that it encompasses, health, vitality, wholeness or we can separate ourselves out, place ourselves above it and pay the price through the sacrifice of others, be they the less fortunate, the disempowered, the wild, the domestic, organic or mineral. It is all ultimately one and we sacrifice one at the cost of all. We must choose! Let us choose wisely for thoughtful reasons, not out of ignorance, habit and custom. See also my other postings on Adaptive Management and Sustainable Landscapes. This entry was posted in Adaptive Management, Assessment, Defined Future Condition, Design, Horticulture, Intervention, Maintenance, Natural Areas, Plant Choice, Plant Communities, Plant Selection, Practice, Prescription, Site Analysis, Street Plantings and Medians, Sustainable Landscapes, Weed Control, Weeds and tagged Tri-Met Orange Line Landscapes on October 25, 2016 by gardenriots. Nice article Lance – lots of research and much to ponder. I watch ODOT and Tri-Met landscapes and feel sad and a bit pissed off.